Baumgartens ergosof pen will make writing a joy. The wishbone shape design encourages the time-tested "tripod" finger grip. This grasp is not only comfortable, but is also more ergonomic. 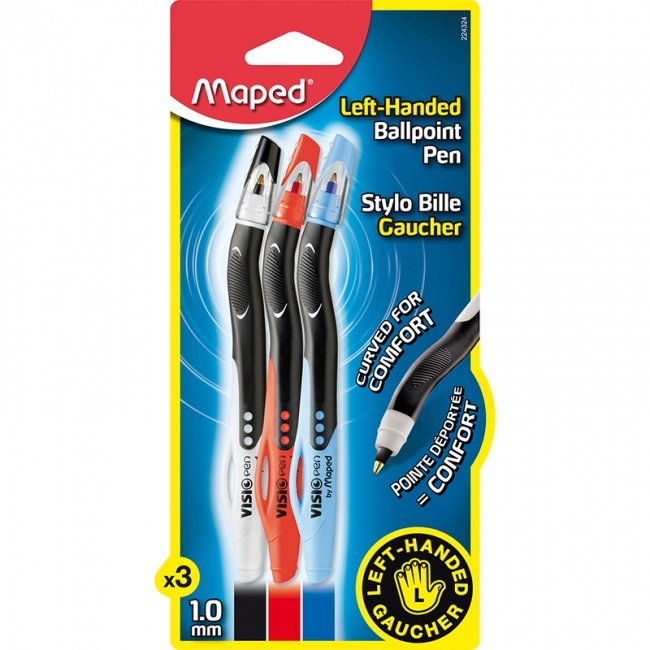 Whether you are right or left handed, the ergosof pen will prevent sore fingers and tired wrists. 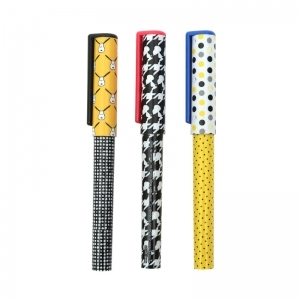 The dynamic tripod pen hold has been shown to help children focus on the content of their writing rather than having to worry about their control of the pen or their speed of writing. Now they can express themselves through writing with ease. 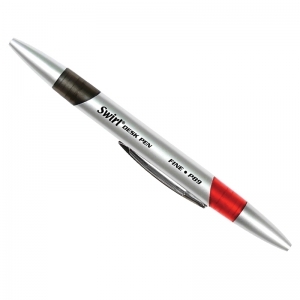 The pen is retractable so you won't have to worry about leaks. It has easy to replace refills so that you're never short of ink. Black ink. 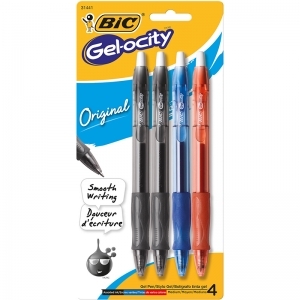 Each pen incudes 2 extra refills. Along with new enhancements like a pocket clip, retractable cap, easier refilling and more streamlined ergonomics, the new Ergo-Sof PenAgain is also finished with a soft rubber coating that adds extra comfort and style. All Ergo-Sof pens come with two additional black refills. . The Patented tripod design delivers a tension free writing experience that works "Lefties" and "Righties." Exciting new proprietary rubber coating feels like soft silk. The focus is comfort. These pens are designed for the human hand and are the world's most comfortable ergonomic pen. The Penagain® is great for young and old alike. 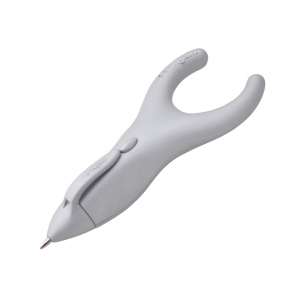 It's unique shape positions the writing instrument in your hand to improve writing ease and distribute the pressure on your fingers to reduce pain. The Original PenAgain™ Ink Refills. Refills for both PenAgain® Ergosof and PenAgain® Original. Easy to refill. The focus is comfort. 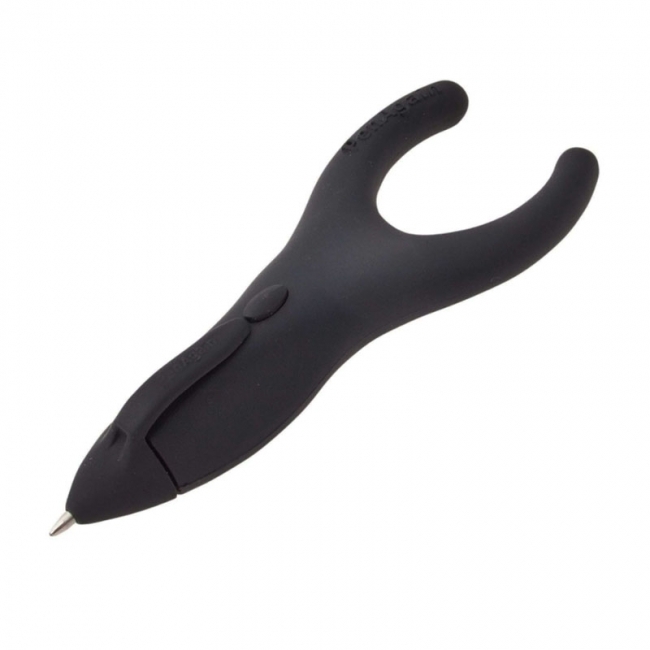 These pens are designed for the human hand and are the world's most comfortable ergonomic pen. The Penagain is great for young and old alike. It's unique shape positions the writing instrument in your hand to improve writing ease and distribute the pressure on your fingers to reduce pain. 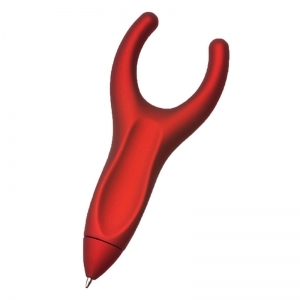 The original PenAgain pens feature the wishbone shaped design that forces the "tripod" finger grasp. 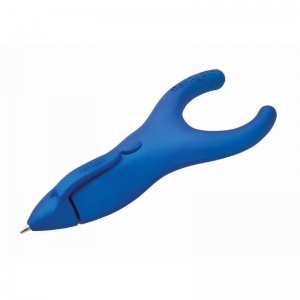 This ensures the proper writing position to reduce hand fatigue and cramping. 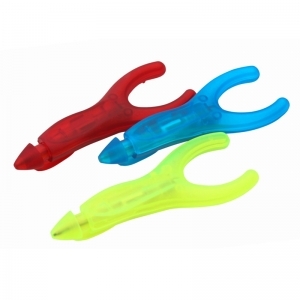 Comes in an assorted color 3-pack (blue, red, neon green). 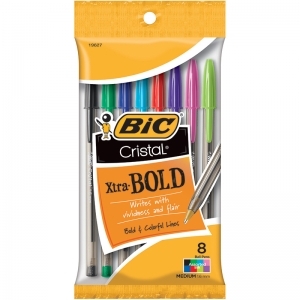 BIC® Cristal® Xtra Bold Fashion Ball Pen writes with vividness and flair! Clear tinted barrel to see ink supply. Matches ink color. 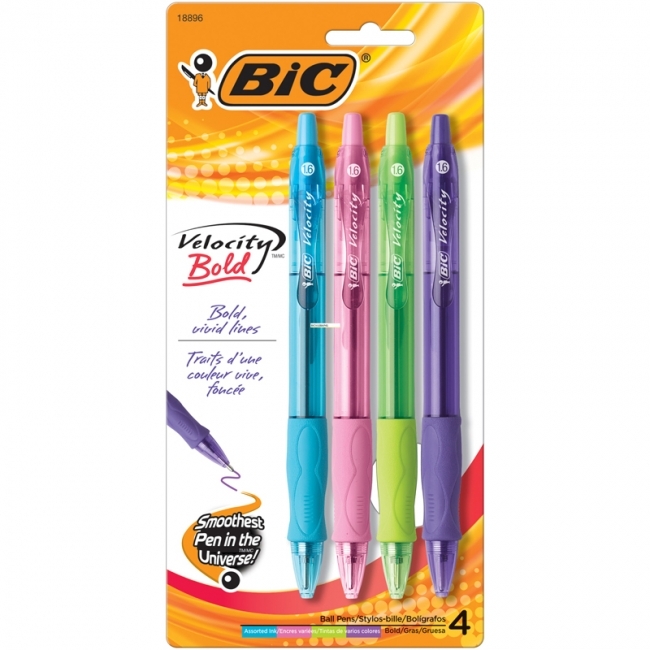 Smooth writing in black, blue, red, green, light blue, pink, lime green and purple inks. 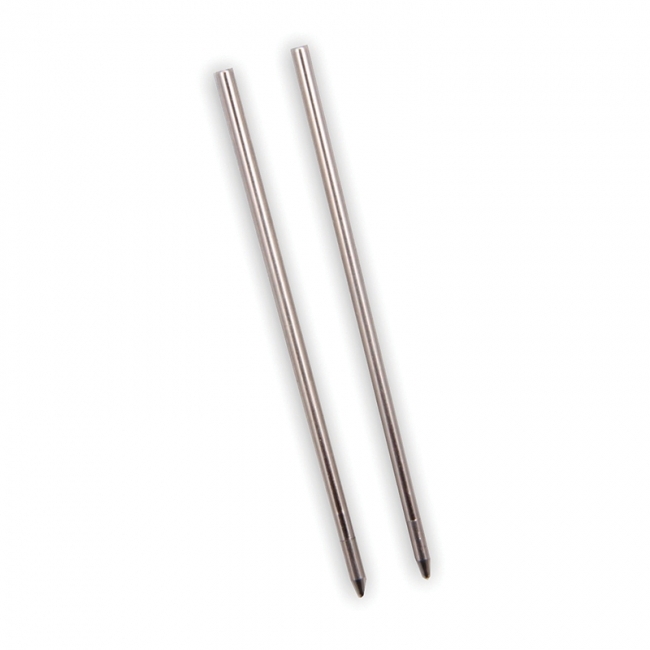 1.6 mm point for bold, vivd lines. 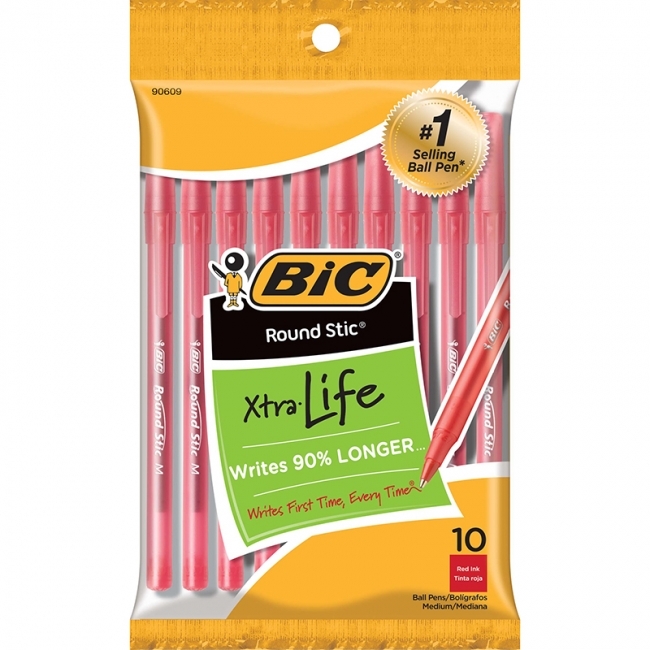 Rubber grip for comfortable writing. 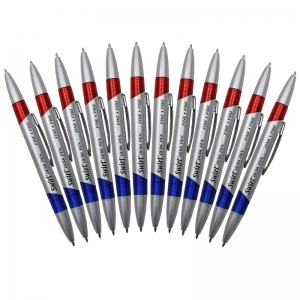 Each pack includes three different designed ball point pens (one black pen, one blue pen and one red pen. Brand : J.R. MOON PENCIL CO. 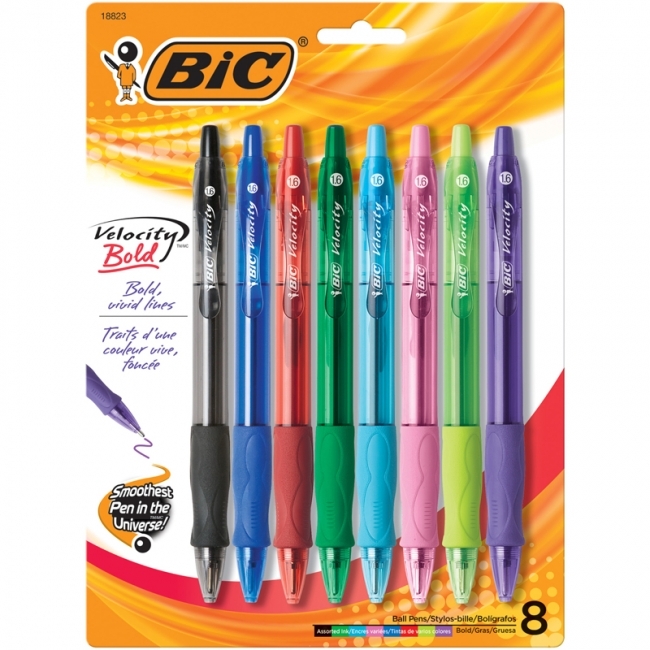 This pen is a teacher favorite that eliminates the need for multiple pens. 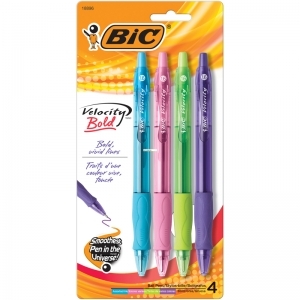 Dual colored ink pen for writing and correcting. Blue ink at one end, with red on the other. 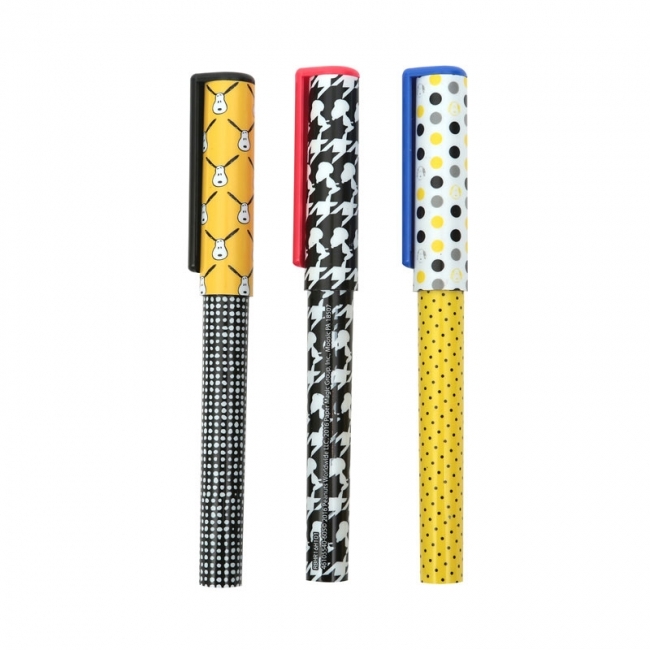 No more searching for lost pens or misplaced pens with this all in one. This pen is a teacher favorite that eliminates the need for multiple pens. 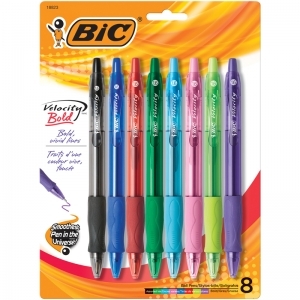 Dual colored ink pen for writing and correcting. Black ink at one end, with red on the other. 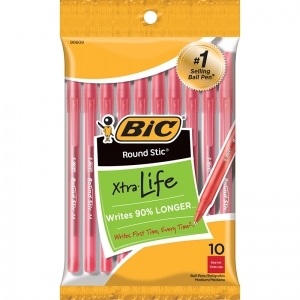 No more searching for lost pens or misplaced pens with this all in one. 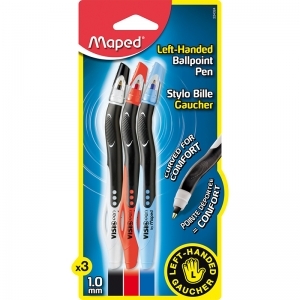 Maped® Visio Left-Handed Pen. 3 pack includes black, blue, and red. 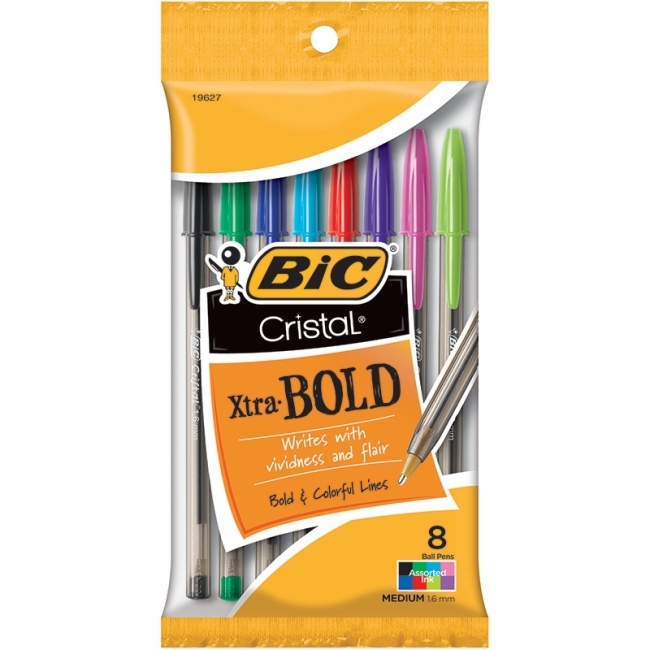 Designed for left-handed writers, this ball-point pen has quick-drying ink, a rubberized grip section, and a line width of 0.7 mm. Capdesign. Disposable.